Golf Chess Set A masterpiece and unique large 925 sterling silver (NOT silver plated) golf chess set. Comprised of 32 highly detailed and outstanding golf style pieces, 16 made of sterling silver and 16 made of gilded sterling silver. 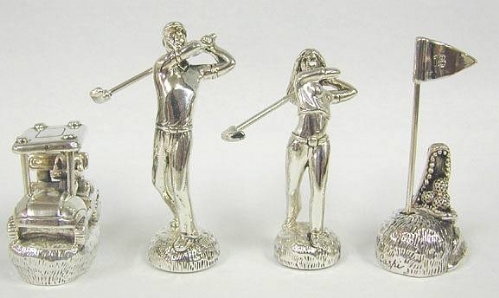 The pawns are designed as golfers, the rooks are as golf hole number 18, the knights are as golf carts, the bishops are as golf clubs, the kings are as male golfers and the queens are as female golfers. The wooden case is beautifully with fluted with two horizontal lines, it is topped by a removable wooden cover which is set with a silvered and gilded metal playing board; it is removable by pressing down on two corners. This set was made in the electroforming method. 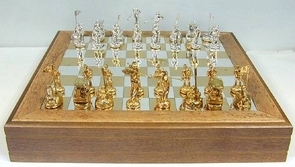 An extraordinary set which will amaze any observer, sure to be the highlight of any game or display, and bound to make an excellent gift to any chess and golf lover. Measurements: Board: Length: 20.5in. / 52.07cm. Width: 20.5in. / 52.07cm. Height: 3.5in. / 8.9cm. Pawn height: 2.5in. / 5.1cm. King height: 3.7in. / 9.4cm. Weight: 6930gr. / 222.8oz. Marks: 925 for sterling silver and makers mark.